In a move that could effectively end construction of any new conventional coal-fired power generation in the United States, the Environmental Protection Agency (EPA) today has proposed the first limits on greenhouse gas emissions from new power plants. The average US coal plant today emits about 2249 pounds of carbon dioxide per megawatt-hour of power produced. The new EPA rules will limit those emissions to 1000 pounds of carbon dioxide per megawatt-hour or at about the level of a modern natural gas plant. The initial impact of the emissions rule on utilities is expected to initially be negligible; with natural gas prices at 10 year lows most utilities are shutting down coal plants, not building new ones. By the end of 2011 the share of electrical power generation from coal-fired plants dropped below 40 percent, the lowest share since 1978 according to the Energy Information Administration. 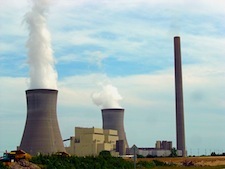 Jackson said that the EPA has no plans to set rules on existing plants, and the new limit will apply only to the construction of new power plants. Fifteen plants with pending instruction permits are exempt from the proposed rule.